This dish goes wonderfully with a chilled Chardonnay or dry Reisling. In a bowl mix flour, salt, pepper and rosemary. In another bowl mix broth, lime juice and capers. In a large skillet heat oil to medium-high and cook chicken 5-6 minutes per side until cooked through. Remove chicken to a plate and set aside. In the same skillet and add the broth, lime juice and caper mixture and bring to a boil. Then add white balsamic and wine, bring to a simmer again and reduce for 8 minutes. Add butter and the chicken and heat through 1 to 2 minutes. 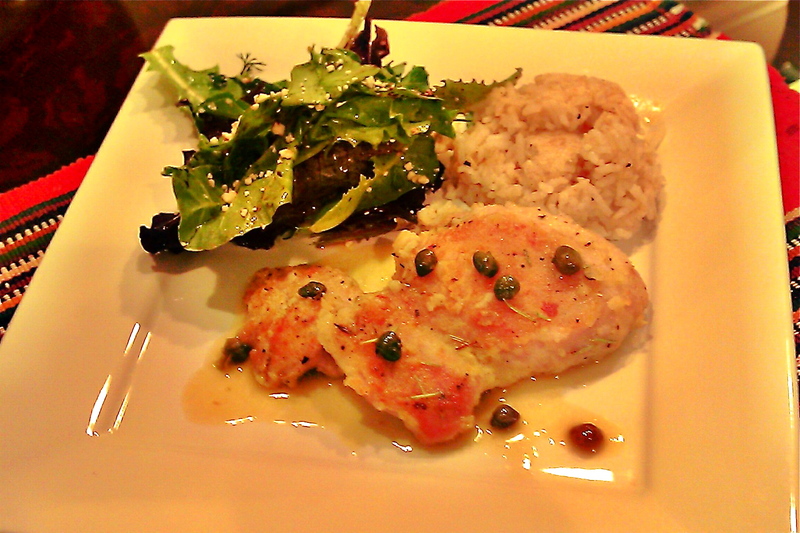 Serve chicken topped with wine sauce and capers. Thank you – you just solved tonight’s cooking dilemma. Awesome!..I can use my capers I have in the fridge…thanks!